Many businesses know the importance of becoming “experience-led” and want to get there, but knowing where to start can be overwhelming. 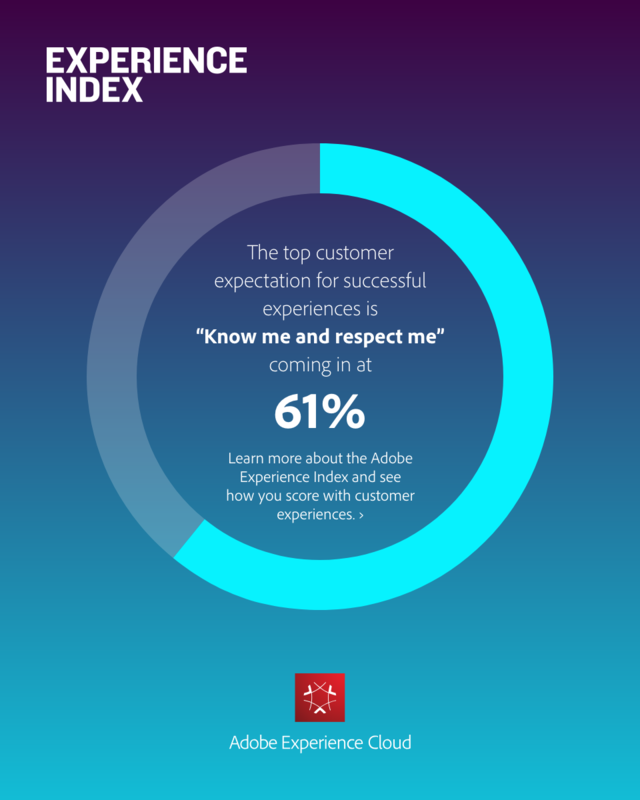 Adobe recently created a new customer Experience Index after surveying more than 1,500 people across the country. The results show powerful insights into the minds of customers and show areas where companies are excelling with customer experience and where they can improve. According to Tamara Gaffney, Strategic Insights Engagement Group Director at Adobe, the general findings of the study break down into four tenets of experience that businesses should have. The four include: Delight Me, Know Me + Respect Me, Speak in One Voice, and Keep Technology Transparent. These are general themes outlining where companies or industries as a whole can improve. Some companies are doing better than others. One of the biggest complaints from customers across all industries falls under the tenet of Speak in One Voice. Many customer frustrations arise from brands not following through on promises and not being genuine about what they said they were going to do. Issues also arise when there are hidden fees or the brand isn’t transparent. Adobe classified certain actions as Experience Makers and Experience Breakers. Making the customer feel tricked is an Experience Breaker. Tamara said it is extremely hard for companies to speak in one voice, especially with all the communication channels that are available these days. In order to cut through the clutter and provide a consistent message and experience, companies need to break down data silos and focus on integrating internally so they can present a united and consistent front to customers. Data and technology also play a huge role in the modern customer experience, though Tamara emphasized that companies can’t just rely on data alone. Survey respondents said they were delighted with new tech offerings, especially when it comes to helping brands create personalized experiences. In the technology section, the highest scores were for the importance of personal service, but the lowest scores were for preferring to interact with a human over a computer. Essentially, consumers understand that there are times when it is easier and better to interact with a computer and times where a human can provide better service. When getting a basic answer or filing a form, consumers like to interact with computers for fast service, but when it comes to getting personalized recommendations or answering more complicated questions, humans do a better job. Customers like to have options of how to get the best service. Another theme throughout the survey related to customer feelings and expectations from different generations. The most demanding generation is Millennials aged 25-34, most likely because they are becoming much heavier consumers. Younger consumers age 18-24 are more aligned with the older generations when it comes to what they expect from brands. However, just because customers aren’t complaining doesn’t necessarily mean they are happy—consumers aged 50 and older are less likely to complain, but it’s often because they’ve given up, not because they really are happier with the experience. The key takeaway from this data is not to assume that quiet customers are happy and to work on creating a great experience for customers of all ages. There’s also a lot of talk in the customer experience world about the importance of surprise and delight. According to the survey, most companies are doing a fairly good job of surprising and delighting customers, but there is still room for growth. To most effectively surprise and delight, brands should focus on the things customers do most often. A surprise and delight experience for something they do once a year is nice, but it’s more impactful to put that effort into building a surprise and delight experience on something customers do more regularly. Tamara advises all companies to measure how they are doing with customer experience. Although Net Promoter Score is widely used and helps measure customer satisfaction, it doesn’t tell the whole story. Companies that want to become experience-led need to use more detailed data by creating surveys, talking to customers, and looking on social media. They need to understand their own Experience Makers and Experience Breakers and invest resources into strengthening those areas. Even the most experience-led businesses can’t do everything at once. As the data shows, there are areas where companies are excelling at customer experience, and there are also areas with potential for growth. The key is for each company to figure out and address the biggest challenge areas and then put an emphasis on surprising and delighting customers at the biggest opportunities. A strategic and informed approach to customer experience can change how brands interact with customers. Disclosure: Adobe is a former client of Blake Morgan’s.